If you're a Sprint customer who's been patiently awaiting your chance at a Galaxy Nexus, just head over to Sprint's pre-order page here. Those interested can see Sprint's full press release below. Galaxy Nexus will be available in Sprint Stores, Sprint Business Sales, Telesales (1-800-SPRINT1) and Web Sales (www.sprint.com) beginning on Sunday, April 22, for $199.99 (excluding taxes) with a new line of service or eligible upgrade and two-year service agreement. Pre-order begins today at www.sprint.com/nexus. 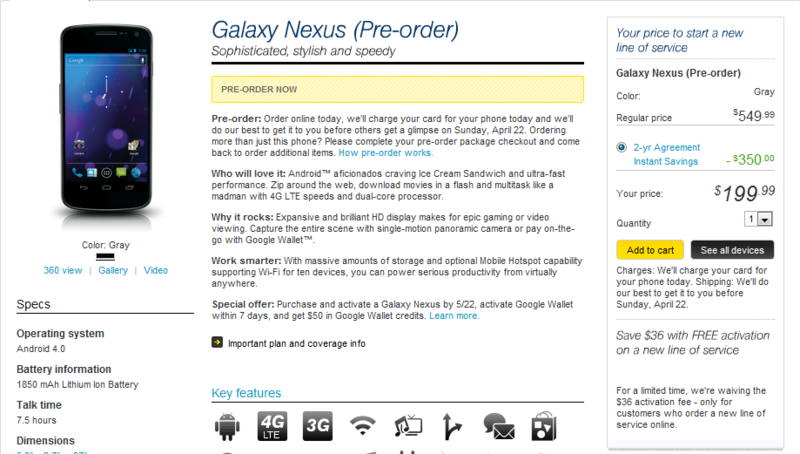 Customers who pre-order Galaxy Nexus will begin receiving their devices as early as Friday, April 20 – two days before the device goes on sale – while supplies last. · Face Unlock: Galaxy Nexus introduces a new, fun way to unlock the phone – with a smile. State-of-the-art facial recognition technology lets the user switch on their phone and look at it to get past the lock screen – no passwords to remember, nothing to type or swipe. · Android Beam™: Share contacts, web pages, YouTube videos, directions and apps – just by touching two NFC-enabled Android phones back to back – tap to beam what’s on the phone to a friend. · Google+™ Hangouts: Video chat with a group of up to 10 friends using the 1.3-megapixel front-facing camera, all on the go. · A 1.2GHz dual-core processor and a brilliant 4.65-inch HD Super AMOLED contour display with 1280x720 resolution. · Google Play™: With more than 500,000 apps, millions of songs and books and thousands of movies, Google Play has something for everyone. · Google Wallet: Turn the smartphone into a wallet using NFC to make safe, secure purchases at more than 100,000 participating retailers. · Google Voice™ makes people’s lives easier by providing one phone number to use for the rest of their life. Easily manage up to six devices with one Sprint phone number, use intelligent call routing and advanced call controls like call screening, blocking and recording, and online management of SMS, voicemail and call logs at www.google.com/voice. Sprint recently announced Atlanta, Baltimore, Dallas, Houston, Kansas City and San Antonio are expected to have 4G LTE and enhanced 3G service in mid-year 2012. The anticipated launch of these large metropolitan areas demonstrates the continued commitment by Sprint to invest in its network through Network Vision. Sprint customers in these areas will soon enjoy ultra-fast data speeds and improved 3G voice quality. For the most up-to-date details on Sprint’s 4G LTE rollout, please visit www.sprint.com/4GLTE.